Esta cabine começou como um moinho movido a roda d'água. Foi completamente remodelado, mas ainda é apenas os pés longe do riacho. O som da água correndo é altamente relaxante e faz uma tremenda noite de sono. O quarto principal localizado no piso térreo, tem uma cama king-size. O segundo quarto localizado no segundo andar tem uma cama full-size e uma cama de solteiro. Há também um grande loft no segundo andar com vista para sala de estar, sala de jantar e cozinha. Esta cabine está perto de Ellijay e Blue Ridge. Os rios Toccoa e Ocoee estão próximos. O término do sul da Appalachian Trail está a apenas seis milhas de distância. Helen Geórgia é também apenas a uma curta distância de carro. A cabine tem acesso ilimitado à Internet WiFi. Também a nota, há uma taxa de US $ 50 adicionado a uma noite reservas. Não fumar dentro da cabine. Por favor, máximo de 5 missões. What a hidden gem this cabin is, we loved our stay by the creek. If we ever travel back to this area, we will book again. We Really enjoyed our stay at the cabin. The creek was fabulous! We enjoyed catching the trout. What a wonderful location for a family vacation. The cabin was clean well-stocked with cutlery and cookware. I actually felt like I was at my own home I had everything I needed to take care of my family. My two teenagers enjoyed the local hiking and exploring the creek. The large windows in the main living space overlook the creek as it came down the mountain, I enjoyed sitting there in the early morning and late evenings just watching and listening to the creek. The cabin has two levels my two teenagers took the upper loft area which has two beds, half bath and a small sitting area which they took full advantage of. The cabin has large open porches to sure and enjoy your surroundings. I spoke with the groundskeeper several time through a text or over the phone he was extremely helpful and informative. 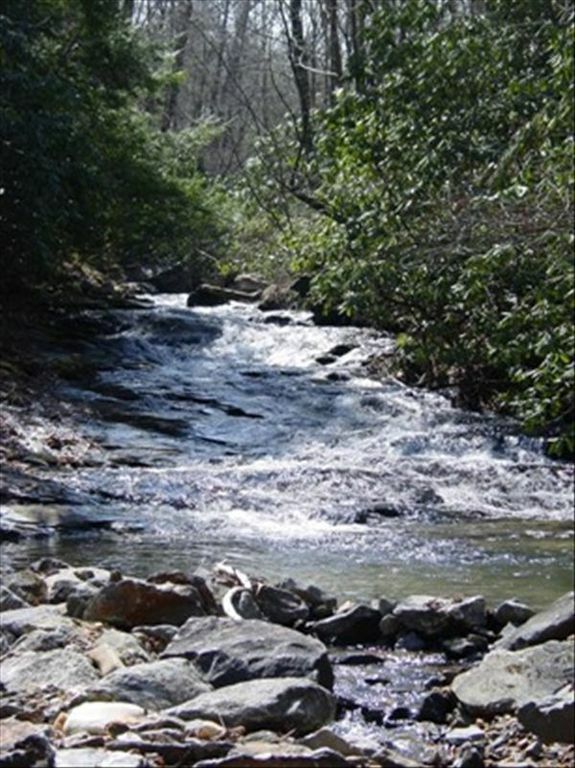 We are excited to book another visit there in the summer time so the younger kids can play in the creek and maybe do some local fishing. This is definitely a return vacation spot for us. My son and I stayed 2 days while exploring Blue Ridge. Our first impression of the cabin was how wonderfully clean it was. The way the cabin is situated allows a bresthtaking view of the stream from 2 porches. Coffee by the fireplace while marveling at the scenery was a heavenly way to start the day. This cabin is an excellent choice for adults with or without children. There is ample indoor space and the kitchen anemities include the best selection of cooking tools I have ever had in a rental place ( even a crock pot). This rental earns a double " thumbs up". We had a wonderful relaxing visit. Love this cabin!!! Right on the creek - loved it! The first thing you see in the morning after coming out of the bedroom is the creek right outside the window. Was breathtaking! We were only there about 48 hours but seemed to be well stocked with kitchen supplies, games, etc. Would definitely like to come back!! Please note, there is an additional $50 fee for one-night reservations (if a one-night reservation is accepted). Rates are subject to change until booked and paid for.